"Thunderspace utilizes stereoscopic 3D audio & realistic lightning flashes to create a thunderstorm around you." This basically means they recorded the sound of real thunderstorms using real surround sound 3D technology and then sync your devices flash to light up at just the right time. 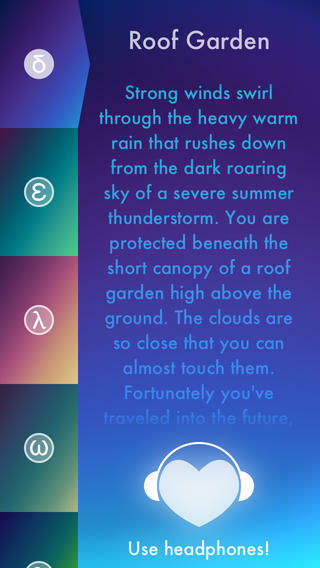 You basically use this app with headphones and lie down with the flash in back of your head but close by (so you can "see" the lightning with your eyes closed). You can of course make additional in-app purchases to add new soundtracks, but many of them are free too today (usually $1.99 and up for each add-on pack). The app typically costs $0.99 and it is also free today. I tried this and like it a lot. I say download it and the free add-ons today.